If you are looking for a great show that entertains, makes you laugh and lifts your spirits, then don’t miss ‘Lee Squared.’ The final 3 performances are scheduled for 5 pm on Feb 1, 3 & 4 at The Red Room. David brings the flamboyant life and talent of Liberace to his audience in a most touching and endearing way. From his wonderful sparkle to the lavish costumes and rings, we felt that we are once again experiencing this legendary entertainer. And the smile, the voice and the piano playing are amazingly similar. Liberace gets another chance to touch our hearts as he tickles those keys on his grand piano. Chuck Sweeney keeps the memory of Miss Peggy Lee alive with a hilarious impersonation that includes a delightful dose of camp. The one line zingers and stories have us roaring with laughter throughout their performance. Chuck is a dead-ringer for Peggy Lee with the wig, glasses, glitter and feathers. Some of the highlights of the show include Peggy Lee’s performance of the Tina Turner version of “Proud Mary,” which had the audience howling with laughter. She also did imitations of her favorite friends in the biz, Joan Rivers, Judy Garland and Cher. David’s Liberace took us down memory lane with stories, songs and piano solos. There was even some fun, non-threatening audience participation. And we were treated to a brilliant song medley that they had put together to audition for the television show, ‘America’s Got Talent.’ They closed out the show with two very special songs from the past that touched our hearts. This show has something for everyone. 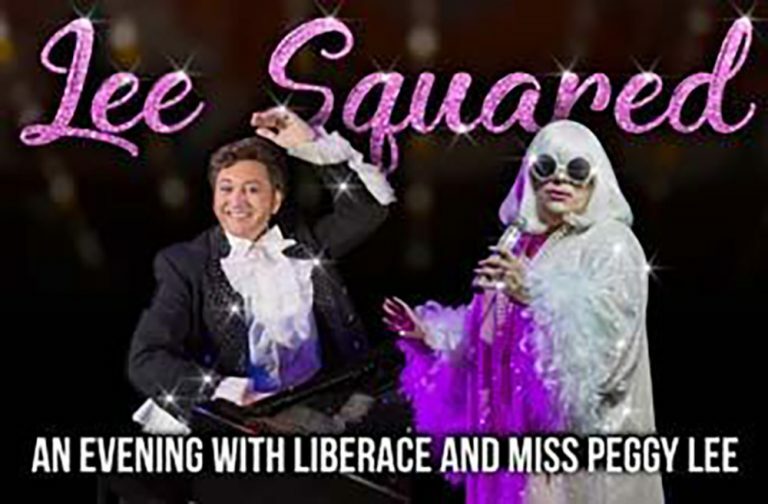 Share an evening of music and laughter, and experience the extraordinary playing of Liberace and the sultry jazz of Miss Peggy Lee. ‘Lee Squared’ is a fun show delivered by two accomplished performers. The music is wonderful, the comedy is non-stop and the performance is first rate. I think you’ll be impressed with this show. ‘Lee Squared’ is only here for a few more shows, so go to www.actiientertainment.com for information and tickets.